Huge heron ... not a plastic one ! They always look so strange perched on roof tops, don't they. I bet he's got his eye on some poor persons pond. He looks huge TT ,great photo . Thanks Sandra and Janette ..
We get one sitting on the bridge and staring into the stream. I suppose there must be tiny fish in there. Very majestic looking birds, I love them. There is a Heronry just near us and we often see them around. Oh, that's a shame, Amy. Well spotted Tt great photo. I have chased one away from my pond once this year. I wasn't fast enough to get his photo. I put a closer pic. of the heron on my blog, but this shows how near the heron was to my garden ... Not a normal sight around here ! It would look great on ispyabird Terratoonie lol would nt upset no one then , its a great photo. When we went to Chester Zoo some time ago there were herons all around one of the larger ponds. I never realised they were such big birds until I got so close. Only a few feet away. ... and visiting such a built up area ! He's lovely. My son and I love the herons. We used to live by the river and would always see them by the weir. When he was little my son always called him "Mr Heron" and we still call them Mr or Mrs Heron today! Funny ! used to keep koi carp,and dreaded these turning up,very expensive fish to lose! I meant to ask is that another heron flying in the sky too Terra? Richard ... I don't think that's another heron in the sky. I took the photo very early morning, wearing pyjamas ...standing on a plastic chair in my garden... Lol. 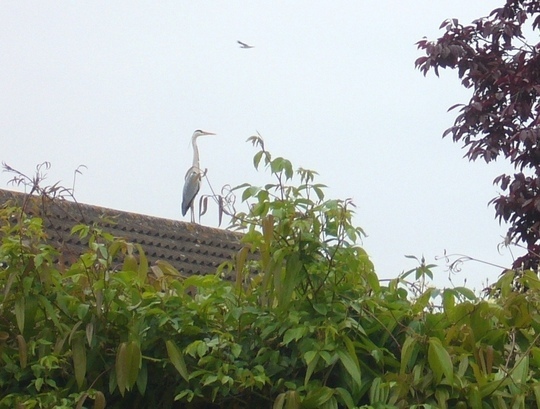 There's a closer pic of the heron above, on my recent blog "Garden Guests". Nice picture thank you for the pointer. The heron flew away soon after this pic was taken .. I didn't notice the other bird flying overhead till I had the photo larger on the computer screen ! the usual local "feathered friends" are sparrows and blackbirds. .Lol. I love herons, they look so pre-historic when they fly, like a pterodactyl. We have a lot in the river behind our house, luckily they don't venture up to my ponds. Very reclusive around here, can't get too close or they fly. I've heard many people complain of them cleaning out their ponds though, they could do some damage on the rubber liners too. I don't have a pond .... glad they don't visit yours.. Fantastic shot TT mind you I would not like it in my garden . At this time of year I can get pheasants wonder in . Windmill will keep the herons away on windy days...Lol.